Pump-probe spectroscopy in the UV/VIs-NIR with 10fs resolution, capable of tracking excited-state dynamics up to 1ms. In addition, we run several steady-state spectroscopy set-ups including linear absorption, steady-state photoluminescence, Raman spectroscopy. To study organic semiconductors and biological samples, we mainly use transient absorption spectroscopy. This technique uses laser pulses as short as 7 femtoseconds (7 millionths of a billionth of a second) to take snapshots of the electronic and vibrational state of the molecules after they have absorbed light. By delaying the time at which the 'probe' pulse arrives to take a snapshot of the molecule, we can track the dynamics of the electrons in the molecule as a function of time. In general, photoexcitation leads to an excited state with spin-0 character known as a singlet exciton. This can convert to a spin-1 excited state (a triplet exciton) through intersystem crossing. In systems made up entirely of Carbon, Nitrogen, Oxygen, Hydrogen or even Sulphur, intersystem crossing generally takes 10s of nanoseconds or more. However, in certain systems, when the triplet energy is roughly half the singlet energy or less and there is enough space, the singlet can split into two triplet excitons. The splitting process is known as singlet exciton fission. The ability to generate two excited states from one photon could be used in solar cells to dramatically improve their efficiency. The fission process is still not fully understood. We have studied a range of materials with the aim of understanding - and one day hopefully controlling - singlet exciton fission. In polycrystalline pentacene films, singlet fission occurs with a 80fs time-constant . In a polymer poly(3-thienylene-vinylene), it has a time-constant of roughly 45fs  and in carotenoid aggregates it ranges from 50-100fs depending on aggregate type . In organic solar cells, absorption of light typically creates a tightly bound electron-hole pair. To collect the charges and produce current, the e-h pair must separate. This happens at a junction between an electron accepting and an electron donating material. By directly tracking the separation of the charges, we showed that they separate to 4nm within 40fs thereby overcoming the electronic Coulomb potential between the electron and hole. This fast separation occurs due to the wavelike nature of electrons which are governed by fundamental laws of quantum mechanics. We were able to track the electron-hole separation using the electric field generated between them as they separate. This electric field perturbs the spectra of the surrounding material and leads to an electro-absorption feature. Measuring the evolution of the electroabsorption using transient absorption spectroscopy allowed us to track the charge separation in a polymer:PCBM blend and a small molecule:PCBM blend. 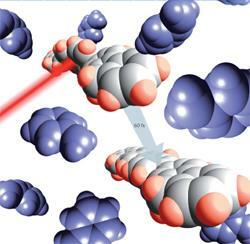 See more here and in Ref. .
A single photon can alter the shape of a molecule. In the eye for example, a photon drives the cis-trans isomerisation which allows us to see. Using a pump-push-probe technique, we showed that quantum effects can play an important role in this change leading to conformation relaxation rates hundreds of times faster than previously expected. In general, conformational change occurs on a timescale defined by the energy of the main vibrational mode and the rate of energy dissipation. Typically, for a conformational change such as a twist around the backbone of a conjugated molecule, this occurs on the tens of picoseconds timescale. However, we demonstrated experimentally that in certain circumstances the molecule, in this case an oligofluorene, can change conformation over two orders of magnitude faster (that is sub-100 fs) in a manner analogous to inertial solvent reorganization demonstrated in the 1990s. Theoretical simulations demonstrate that non-adiabatic transitions during internal conversion can efficiently convert electronic potential energy into torsional kinetic energy, providing the 'kick' that prompts sub-100 fs torsional reorganization. See Ref. and the News and Views by Prof. Mukamel here. Under intense laser excitation, thin films and suspensions of graphite and its nanostructure, including carbon black, nanotubes, few-layer graphenes and graphene oxides, exhibit induced transparency due to saturable absorption. This switches to optical limiting only at very high fluences when induced breakdown gives rise to microbubbles and microplasmas that causes nonlinear scattering. Here, we showed that dispersed graphenes, in contrast, can exhibit broadband nonlinear optical absorption at fluences well below this damage threshold with a strong matrix effect. 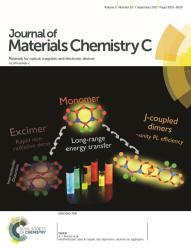 We obtained, for nanosecond visible and near-infrared pulses, a new benchmark for optical energy-limiting onset of 10 mJ cm−2 for a linear transmittance of 70%, with excellent output clamping in both heavy-atom solvents and polymer film matrices. 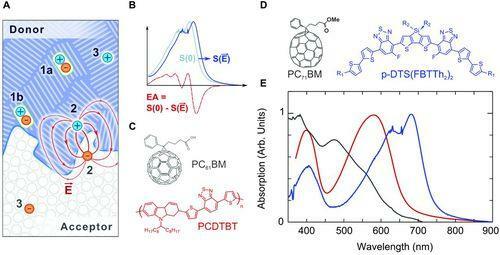 Nanosecond pump–probe spectroscopy in chlorobenzene reveals that the nanographene domains switch from the usual broadband photo-induced bleaching to a novel reverse saturable absorption mechanism with increasing excitation densities across this threshold. Above: Strong solvent/matrix effect on the nonlinear optical properties of dispersed sub-GOx. a, Plot of output versus input fluence for a neat film of sub-GOx (T'=0.97), and sub-GOx in PMMA (T'=0.40) and in PC (T'=0.055). T ′ is the limiting differential transmittance. The linear transmittance T is 0.73 for all films. b, Plot of output versus input fluence for sub-GOx dispersed in different solvents compared with C60 in TOL and single-walled CNT in THF, all in cells with 1.0 mm path length. NMP, N-methylpyrrolidinone; THF, tetrahydrofuran; ANS, anisole; MES, mesitylene; DFB, 1,3-difluorobenzene; BN, benzonitrile; CB, chlorobenzene; BB, bromobenzene; DCB, 1,2-dichlorobenzene; TCB, 1,2,4-trichlorobenzene; TOL, toluene. T is 0.70. The large non-linear effect is due to the formation of localised exciton-like states which we attribute to triplet excitons due to the heavy-atom effect. We speculate that the initial electron–hole gas condenses to triplet-like excitons when promoted by spin–orbit coupling with heavy atoms. In contrast, in graphite or multilayer graphenes in which the inner layers are effectively isolated from the environment, the electron–hole gas cools and recombines rapidly. 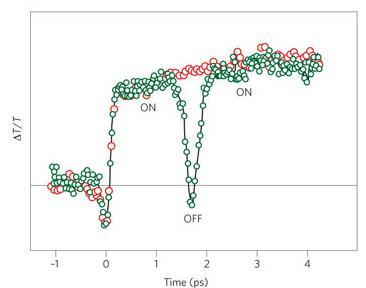 The ability to switch light with sub-picosecond time-scales in an optical fiber network is important for improved signal data communication speed and potentially for optical computing. We made a logical NOT gate using gain switching in isolated conjugated fluorene oligomers. We use the fact that charge absorption overlaps with stimulated emission and generate charges on the oligomers which recombine within a few tens of femtoseconds. The change from amplification through stimulated emission to loss through charge absorption produces a large switching signal and the recombination allows for ultrafast sub 100fs switching. Above: Change in transmission when excited with a gating pulse. Moving from ON (gain) to OFF (loss) and back again within 150fs.